supplied by our professionals with a great care. Our Semi Automatic Paper Cutting Machine has a friction clutch system which provides maximum efficiency and low maintenance. 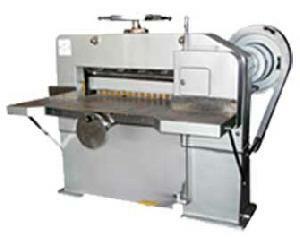 Machine Size 33" 36" 43"
Length of Cut 33" 36" 43"
Width of Cut 33" 36" 43"
Pile Cut 4" 4.5" 5"
Cuts per Minute 32" 28" 25"